Eye Magazine | Feature | What is this thing called graphic design criticism? Rick Poynor: Terms such as art criticism, literary criticism, architecture criticism and film criticism are so familiar that they require little explanation, whether we are interested in reading their products or not. They are all activities with obvious, readily identifiable roles and job descriptions attached: ‘art critic,’ ‘film critic’ and so on. They bring to mind the names of writers who specialise in the subject, achieve a continuous critical presence through their publications and are identified with a particular sensibility, style of writing, set of ideas and point of view. Compared to art or film criticism, the term ‘graphic design criticism’ has an unfamiliar, slightly uncomfortable ring. It is one that even the most avid reader of graphic design magazines and books will encounter only rarely, if at all. In the 1990s, the call for such a criticism has nevertheless become steadily louder, the few exponents increasingly prepared – though still fairly tentatively – to identify themselves as such. A collection of critical writings on graphic design – some drawn from Eye – has recently been published (see the review of Looking Closer: Critical Writings on Graphic Design in Eye 16) . Ten years ago the more forward-thinking designers urged the development of such a criticism, believing that it was part and parcel of a mature profession. Now that it is happening there are murmurs of discontent and, despite the example of neighbouring disciplines, the critic’s motivation is in doubt. ‘Criticism,’ one internationally renowned designer declared, ‘usually takes the form of the negative and the overly judgmental’ . So what exactly is graphic design criticism? Who practices it, or ought to practice it, and what are its aims? And can it, in the sense that we might talk about art or film criticism, be truly said to exist at this point? Michael Rock: While we might not recognise it as such, design criticism is everywhere, underpinning all institutional activity – design education, history, publishing and professional associations. The selection, description and reproduction of designed artefacts in books and magazines, for instance, is the work of theory. Objects are represented to make a point – even if the point is as simple as ‘My, isn’t Rick Valicenti a genius’ – and that is a critical position. Famous designers, complaining about over-zealous design critics, forget that their fame is created through exposure. For example, while I have rarely encountered actual work by Neville Brody, I have seen hundreds of examples published in the international design press and his own books, carefully organised and edited to give the impression of complete artistic continuity. Thus Brody has an influence and reputation through publishing that he could never have in practice. Writing has a profound effect on Institution Design, the elaborate apparatus that surrounds design production . Design work is exchanged intra-professionally, through publishing, lectures, promotional material and other written forms. Publication may lead to speaking engagements, workshops, teaching invitations and competition panels – all of which in turn further promote certain aesthetic positions. At the same time, an historical canon is perpetually generated, a canon that will influence the next generation of designers by indicating what work is of value, what is worth saving, what is excluded. So the relationship between practice and theory is symbiotic. The 40-year expansion of the post-war design industry has been both critiqued and promoted through writing. RP: We are at an interesting juncture, where those with a stake in graphic design writing are starting to debate the forms such a criticism should take. The principal forums for the critical writing undertaken to date have been the professional magazines. Even in the more critically-minded publications, criticism has run side by side with ordinary journalism and other reader services. Established editorial formats and the need to engage a broad professional audience place pragmatic restrictions on what can be attempted and said. There are those who now feel that such ‘journalistic criticism’ is lacking, that it fails to make its critical positions sufficiently explicit, and that we need, in short, a more academic form of criticism to compare with those generated by, for instance, art, literature or cultural studies . This is potentially of great educational value, but in Britain academic graphic design criticism is at such a rudimentary stage of development, with so little to show in terms of published research, that few conclusions can be drawn (see ‘Agenda’ in Eye 16). To what extent such a criticism will be able to address the working designer is a moot point, though experience suggests that the kinds of journals and books that would carry it will have limited appeal to professional readers. What we hope to achieve with Eye is not so much a ‘journalistic criticism’ – the term makes it sound like something that has fallen short of the real thing – as a critical journalism. By this I mean the kind of writing you find on the arts pages of the Sunday papers: informed, thoughtful, sceptical, literate, prepared to take up a position and argue a case, aware of academic discourse and debates (perhaps even written by academics), but able to make these issues relevant and accessible to a wider readership – writing with a firm sense of its audience’s interests and needs. That, at least, is the ideal. MR: Design critics who have been influenced by cultural studies tend to eschew the celebratory zeal of design journalism and attempt instead to read designed objects as cultural artefacts. As Stefan Collini notes, ‘those who make [cultural studies] part of their self-description regard the demystifying or unmasking of the essentially ideological operation of various forms of … representation as the core and purpose of what they do...’ . Obviously, having work unmasked, exposing the essentially ideological operation at play can be a rather unpleasant experience for a designer more accustomed to back-patting. I think that cultural criticism is surpassing art history, formal analysis and perceptual psychology as the dominant model for design criticism in the United States. Many of my design graduate students study with its teachers in the American Studies and Comparative Literature departments and that influences the way they think about their work. It is interesting to note that cultural studies here is very influenced by the British New Left movement, literary critics like Raymond Williams, and Richard Hoggart’s Centre for Contemporary Cultural Studies at Birmingham University. American scholars too have addressed the popular media in many serious academic projects. There is, in fact, more good critical writing about design than most people realise . I suspect that the longing for academic criticism comes more out of not knowing where to look than a dearth of material. Also, designers’ limited self-definition leads them to reject writing on subjects like advertising or public relations that have a direct bearing on our profession. While we may be heavily invested in the notion of ‘graphic design’ as an independent activity, as a discrete category it doesn’t always hold up under academic scrutiny. Perhaps a different kind of journal, more on the model of Assemblage, might promote experimental forms of writing and cross-disciplinary work. RP: At this point we run into the question of who exactly these different forms of criticism are aimed at and what they hope to achieve. While certain kinds of theory can undoubtedly nourish and reinvigorate design practice, your reference to the cultural studies approach suggests the possibility of a future schism between practice and theory, and a division of ‘graphic design’ into two distinct areas of study, the practical and the critical, attracting different kinds of students. Their aims may not ultimately be reconcilable. Theory’s conclusions will in some cases be profoundly opposed to certain forms of design activity. How meaningful or relevant is the unmasking of ideological operations going to be to the designer making a successful career in supermarket packaging, annual reports for Fortune 500 companies, or the world of glossy magazines? Not everyone shares the leftish political position that underpins the challenge these theories make to design. Few designers will relish hearing that their work is ideologically suspect and that they should design something approved by some cultural theorists instead. This is not to suggest such uncompromising forms of analysis are invalid or have nothing to teach us, simply to be realistic in acknowledging that they will only appeal to designers given to a particular type of critical reflection. Critical journalism offers different kinds of insight and knowledge. It is capable of forms of investigation that more academic styles of criticism overlook. Where cultural theory takes a rather Olympian view – choosing representative but ultimately interchangeable examples for analysis – critical journalism has a strong sense of the particular and uses a close, pragmatic acquaintance with the realities of production to ask more down-to-earth questions about individuals and bodies of work. What is the value of what has been accomplished? What is its immediate context? And its wider implications, both professional and socio-cultural? Designers are making large claims to authorship – both implicit – and these deserve to be tested critically. MR: One of the problems of the cultural theory model is that it has not dealt with formal detail. It may be very effective for discussing the nature of the annual report as a device of capitalistic culture, but weak in discussing the choice of Univers over Helvetica, although such distinctions are within its scope. But all critical positions necessarily require that you leave something out; they are perspectives, after all. To build an effective design criticism, we will have to create our own perspectives, fashioned out of a number of other techniques. What is particularly interesting about criticism in general is how different perspectives give rise to different meanings. This has been fully realised in film criticism, for instance; the same film can be fodder for a formal, feminist, psychoanalytic or semiotic analysis, each offering a new way to read the text. Criticism doesn’t yield answers, only opinions, and opinions should be diverse. Cultural criticism has been useful because it has analysed the institutional rhetoric of design, examined the institutional myths that are perpetuated through education and practice which serve to insulate and promote the profession. If you choose to focus on the individual, the ‘masters of design’ approach, you intentionally narrow your scope; the cultural issue is still present in that it is consciously excluded. For instance, we had years of writing about Modern design without any examination of the relationship between the formal tenets of the movement and corporate capitalism. So we have a lot of information about logos and typefaces and the design ‘heroes’ that make them, but little that situates the work in the culture. We need both types of analysis. RP: I hope that the mixture of profiles, reports and thematic essays published in Eye shows that critical journalism can accommodate a wide range of approaches and subjects. But this leads back to the point I made at the beginning. For graphic design criticism to exist in the sense that it does in other disciplines, and with the same variety of perspectives, it will need dedicated writers. I don’t question the educational value of the critical writing that, for instance, post-graduates produce as part of their studies and I know from experience that their findings are sometimes publishable. But occasional paper writing in the course of research is not the same as being a fully fledged critic, writing regularly about a broad range of graphic design subjects, or many different aspects of the same subject. Whatever the discipline, the critic is engaged in a process of interior and exterior discovery, a risky public dialogue with the subject matter, the readership, and him or herself. Critical positions will inevitably evolve over time. Errors of judgment will sometimes be made. The critic can only learn what is possible by constantly writing. It will also help if they can actually write. Good as some graphic design criticism is, even the best of it has some way to go before it can equal the most fluent, supple and engaging writing on the other arts. One basic but crucial difference is that these more public subjects attract people whose primary ambition and talent is for writing and who realise this ambition through a medium that fascinates them. Graphic design is not by and large – may never be? – a subject. It’s a catch-22, because without such writers to bring it alive graphic design stands much less chance of becoming a discourse of wider public interest. MR: We don’t have a couple of centuries’ worth of books, biographies, films, myths, and stories about making a poster or designing a typeface, whereas we do about painting or writing. Graphic design is such an obscure activity, there are just not that many people who even know it exists, never mind write about it. So most design critics start off as practitioners with a penchant for writing. This explains the collusion that has existed between design practice and the design press. There are other factors that shape the practice of design criticism. Designer / critics are the products of art schools where there exists a deeply ingrained division between the visual and the verbal. Students with verbal skills are suspect. The stereotype is that the verbal student uses language to mask deficient visual skills. Also, as criticism is not at all lucrative, most of us have to work professionally. Therefore, the subjects of our writing are often our friends, colleagues, teachers, clients and students. You have to be willing to take great personal and social risks to write with conviction. Designers may debate the issue of ‘personal expression,’ but there are few forms of expression as personal as writing something down, signing your name and sending it out for all the world to see. There is always teaching. But as design programs are considered professional schools, institutions require significant professional output, rather than writing, before bestowing the tenure plum. There is no escaping it. Like anything else, the only way to get better at design writing is to practice it. But without seven years of graduate study in preparation of a dissertation to hone their abilities, most design critics have to squeeze in writing here and there, and learn on the fly. Unfortunately it shows. Finally, there is little encouragement. Editors are reluctant to risk alienating the very people who make up their subscription lists, or to commission or publish longer or more challenging pieces of writing. Since many designers – reviving the old art school bias – eschew any theorising and demonstrate an alarming lack of curiosity about their own profession, there is a pitifully small audience of new writing. And last, there are few models. The reason we cast about for some critical paradigm is because our profession – the profession of graphic design criticism – is in the process of becoming. RP: I began by quoting a leading designer’s view that too much writing about graphic design is ‘negative and overly judgmental.’ Have we fully answered that charge? ‘Judgmental’ is a slippery word because its use instantly suggests its more desirable opposites: tolerance and understanding. To be judgmental is to wag a finger and raise the voice, to carp and repress. Called to account in such morally loaded terms, criticism can’t possibly be a good thing. But this is, in reality, a considerable misrepresentation of the critical process when responsibly carried out. It is hardly the purpose of criticism to squash its subjects arbitrarily. On the other hand, being a critic does require the exercise of judgment based on all the writer’s knowledge and experience. The writer who wilfully suspends judgment, or fears to make it, lets down the reader and ultimately perhaps the subject itself. This critical process will often lead to conclusions at odds with those of the subject. But while the process might be intrinsically adversarial, it is not inherently negative even if the ordinary usage of the verb – to criticise – makes it sound as though it is . Criticism’s conclusions may be largely or even wholly supportive of the subject. MR: Designers are generally insulated from any broad discussion of their work, but once in the world of commerce, producing materials that affect the lives of millions of people, designers are open to the same kind of response as anyone else in such a position, for instance an architect of novelist. The most interesting criticism uses the subject as an example of a larger idea, drawing connections between the work and the context. In order to write sharp criticism, it is sometimes necessary to exaggerate the differences between things, to compare and contrast in a way that illuminates the subject for the reader. Only lousy criticism is merely judgmental. The key to compelling criticism is to rise above petty judgment and make a rational case for your position, historically supported and logically constructed. Properly executed, even the most biting criticism should be useful, entertaining and instructive. But it would be naive to think that the relationship between the critic and the subject will ever be entirely smooth. Despite the difficulties, I am incredibly optimistic about the practice of graphic design criticism. We are perhaps the first generation of writers who consider themselves, as a form of self-definition, to be graphic design critics, and that sense of being at the beginning of something is extremely liberating. Through the practice of writing, I discover more and more about design and I am very conscious of trying to build a design criticism. It is a huge, organic project that involves years of concentrated effort, missteps, public embarrassments, bruised feelings and misunderstandings but a great deal of pleasure as well. 1. See also ‘Criticizing Criticism: Too Little and Too Much,’ by Steven Heller, AIGA Journal of Graphic Design vol. 11 no. 4, 1993, and Emigre no.31, ‘Raising Voices’ issue, 1994. 2. Letter from April Greiman, AIGA Journal vol. 12 no. 3, 1994. 3. The phrase is borrowed from Michael Speaks’ term ‘Institution Architecture.’ See ‘Writing in Architecture,’ Any no.0, May/June 1993. 4. See ‘A conversation with Andrew Blauvelt,’ Emigre no. 31. 5. See ‘Escape from DWEMsville,’ Times Literary Supplement, 27 May 1994. 6. Neil Harris at the University of Chicago, Jackson Lears at Rutgers University, Stuart Ewen at Hunter College and Johanna Drucker at Yale have all produced substantial work on design subjects. 7. For further discussion of the adversarial nature of criticism see ‘Learning to Live with the Critics’ by Michael Beirut, Eye no. 8 vol. 2. Co-design: New interdisciplinary journal of design and contextual studies. First issue has an article on the semiotics of advertising. 2 Mount Hill Cottage, Stratford Road, Wicken, Milton Keynes MK19 6DG, United Kingdom. Visible Language: Three recent issues are devoted to critical histories of graphic design (vol. 28 nos. 3 and 4, vol. 29 no.1). Graphic Design Department, Rhode Island School of Design, 2 College Street, Providence, RI 02903, USA. Zed: First issue of this new annual journal examines the politics of design. Center for Design Studies, Virginia Commonwealth University, Box 2519, 325 North Harrison, Richmond, VA 23284, USA. 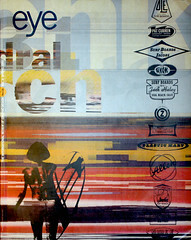 Rick Poynor, Eye editor, London.